Elegant and contemporary, yet still warmly welcoming, this New York Times coveted four star rated restaurant offers a seasonal dinner menu in a sophisticated and attractive setting. Adjoining the restaurant is a positively enticing bar and lounge, offering à la carte dining. With private dining offered in either the Bellecour Room, which seats 90 guests, or the main dining room, which seats 140, Daniel’s Private Dining Director will take care of every detail to make any event, whether business or pleasure, unforgettable. Jacket required. Type of cuisine: Contemporary French restaurant. Note: Closed Sunday and major public holidays. It’s also closed for lunch except for private dining events. Pre-theatre fixed price: Monday – Thursday 5.30 – 6pm, $125 including wine. -3 course prix fixe menu, $108, with wine pairing $168. -6 course tasting menu $195, with wine pairing $300. 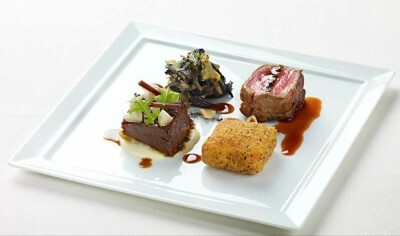 -8 course tasting menu $220, with wine pairing $350. Highly talented and award winning team, sourcing the best ingredients. Zaatar Rice Flake-Crusted Maine Sea Scallops and Duo of Beef is very tasty. But why not blow the budget, and go for the 6 course tasting menu! Without a reservation, made at least two weeks in advance, you stand very little chance of getting a table. Service is seamlessly efficient, polite, and unobtrusive.